ORCID number: Harshavardhan B Rao (0000-0002-6472-4396); Arjun Prakash (0000-0002-5706-2507); Surendran Sudhindran (0000-0002-3973-7697); Rama P Venu (0000-0003-2251-3942). Author contributions: All authors contributed equally to this paper in conception and design of the study, literature review and analysis, and drafting, critical revision, editing and approval of the final version. Conflict-of-interest statement: All authors declare no potential conflicts of interest in regards to this manuscript. Biliary stricture complicating living donor liver transplantation (LDLT) is a relatively common complication, occurring in most transplant centres across the world. Cases of biliary strictures are more common in LDLT than in deceased donor liver transplantation. Endoscopic management is the mainstay for biliary strictures complicating LDLT and includes endoscopic retrograde cholangiography, sphincterotomy and stent placement (with or without balloon dilatation). The efficacy and safety profiles as well as outcomes of endoscopic management of biliary strictures complicating LDLT is an area that needs to be viewed in isolation, owing to its unique set of problems and attending complications; as such, it merits a tailored approach, which is yet to be well established. The diagnostic criteria applied to these strictures are not uniform and are over-reliant on imaging studies showing an anastomotic narrowing. It has to be kept in mind that in the setting of LDLT, a subjective anastomotic narrowing is present in most cases due to a mismatch in ductal diameters. However, whether this narrowing results in a functionally significant narrowing is a question that needs further study. In addition, wide variation in the endotherapy protocols practised in most centres makes it difficult to interpret the results and hampers our understanding of this topic. The outcome definition for endotherapy is also heterogenous and needs to be standardised to allow for comparison of data in this regard and establish a clinical practice guideline. There have been multiple studies in this area in the last 2 years, with novel findings that have provided solutions to some of these issues. This review endeavours to incorporate these new findings into the wider understanding of endotherapy for biliary strictures complicating LDLT, with specific emphasis on diagnosis of strictures in the LDLT setting, endotherapy protocols and outcome definitions. An attempt is made to present the best management options currently available as well as directions for future research in the area. Core tip: Multiple lacunae exist in our current understanding of biliary strictures complicating living donor liver transplantation (LDLT). Although endoscopic management is regarded the mainstay of treatment, results are variable with multiple determinants of success. The definition of these strictures itself may need to be re-examined, from a mere narrowing on imaging studies to a more comprehensive approach which can signify functional impedance to bile flow. This review outlines the current practices of management and endeavours to incorporate novel concepts, such as functionally significant obstructions, endoscopic protocols and outcome definitions, into the wider understanding of endoscopic management for biliary strictures complicating LDLT. Biliary stricture complicating living donor liver transplantation (LDLT) is a relatively common complication, occurring in most transplant centres across the world. Improvements in technique, better postoperative care, surgical expertise and immunosuppressive medications have resulted in a decreased incidence of biliary complications over the years[1-3]. The Roux en Y hepaticojejunostomy has given way to duct-to-duct anastomosis (DD) which is the preferred mode of biliary reconstruction in most cases[4-8]. DD is technically easy, enables rapid gastrointestinal recovery, has a lower risk of cholangitis and maintains physiological choledochoenteric continuity. Moreover, DD allows an easy endoscopic access to the anastomosis, enabling endotherapy in most cases. Thus, surgical management of biliary strictures following LDLT has slowly been replaced by endoscopic retrograde cholangiography (ERC) with stent placement, which emerged as the first-line therapy during the last few decades[1-3,9-11]. Compared to deceased donor liver transplantation (DDLT), the biliary anastomosis in LDLT is more peripheral, smaller and complex[12,13], resulting in tortuous and angulated strictures, especially due to hypertrophy of the transplanted liver. As a result, the efficacy and safety profiles as well as the outcomes of endoscopic management of biliary strictures complicating LDLT represents an area that needs to be viewed in isolation, owing to its unique set of problems and attending complications; it merits a tailored approach, which is yet to be well established. This review focuses on the pathogenesis, morphology and diagnosis of the endoscopic management of biliary strictures complicating LDLT, as well as some unique problems associated with it. An attempt is made to present the best current management options available as well as rational perspectives on future research in the area. LDLT as a treatment for end-stage liver disease is especially popular in most Asian countries, owing to a difficulty in organ procurement from deceased donors[15-17]. However, DDLT constitutes the majority of transplants in the West, being performed within the framework of a uniform, systematic organ allocation programme along with better organ procurement from deceased donors, that ensures shorter waiting periods and allows for the use of DDLT as a standard-of-care for end-stage liver disease. As is apparent, this is predicated on a higher number of deceased donors, early referral for liver transplantation, requisite infrastructure and specialised man-power for fair and efficient organ allotment; a lack thereof is palpable in Asia, paving the way for robust LDLT programmes, especially in far eastern countries like those in Japan, Hong Kong, China and Korea[17-19]. While the principles of endoscopic therapy for biliary strictures complicating DDLT are similar to those that occur with LDLT, there seems to be some differences in the incidence, morphology and type of strictures, which can be summarised as follows. Bile duct strictures are the most common biliary complication after liver transplantation, accounting for approximately 40% of all biliary complications[7,12,20-23]. In general, biliary strictures have been reported to occur in up to 5% of DDLT cases[24,25]. On the other hand, those of LDLT have been reported to occur more frequently: 7.3%-60.0% in right-lobe grafts[4,12,26-28] and 24% in left lateral segment grafts. In a study by Gomez et al, biliary strictures occurred more frequently following LDLT than in DDLT [10/30 (33.3%) vs 27/357 (7.6%), respectively]. Owing to the use of a smaller graft in LDLT (as compared to the whole liver in DDLT), the calibre of the bile ducts used for the anastomosis is smaller, often having a disparity between the recipient and donor ducts. Surgical anastomosis in these cases demand technical expertise and experience in working with small ducts in order to create an anastomosis that is free of tension and has an adequate luminal diameter to enable free flow of bile. As a result, strictures developing in this situation will have a unique morphology and sometimes bizarre configurations. Attempts have been made to classify these strictures based on cholangiographic appearance, size and number of ducts, all of which may have bearing on the outcome of endoscopic management. Posttransplant biliary strictures can be classified as anastomotic strictures (AS) and nonanastomotic strictures (NAS). AS is more common in LDLT patients than in DDLT patients. This system of classification as AS or NAS is extremely useful as clinical outcomes and treatment modalities of the two types are somewhat different. AS account for about 80% of biliary strictures after LDLT. Factors contributing to the development of AS include technical problems of the biliary anastomosis, ischemia or bile leaks. Although the effect of ischemia is far more pronounced in NAS, it might also play a significant role in AS. AS usually present later in the course of the posttransplant recovery, with a median interval of 5-8 mo after the liver transplantation[20,35,36]. It usually is a single, sometimes tortuous stricture, at or within 5 mm of the anastomotic site. NAS, on the other hand, usually results from hepatic artery injury or thrombosis, causing irreversible biliary fibrosis due to ischemia. Other causes which have been implicated include long cold ischemia time or ABO type incompatibility[33,37]. Of all biliary strictures after liver transplantations, NAS accounts for only 10%-25%[11,13,22]. In a Japanese study, NAS accounted for only 6% of all biliary strictures and occurred in 5 of the 273 LDLT patients (2%). In another study with 339 patients undergoing right lobe LDLT, only 11 patients (10%) developed NAS, while 121 patients (36%) developed AS, accounting for more than 90% of the biliary strictures in that patient cohort. The Mayo Clinic Hospital in Arizona reported only 3 of 110 LDLT patients (3%) developing ischemic-type strictures. Biliary complications continue to be the most common complication after LDLT, having a reported incidence of 20%-43%, with biliary strictures accounting for 3%-40% of cases. Most biliary strictures present in the first year following the liver transplantation[9,22,36,38,39] (Table 1). Table 1 Incidence of biliary strictures with median time of onset after living donor liver transplantation. With increasing experience in LDLT, in most Asian countries there has been a decrease in overall incidence of biliary complications, from 30% in the initial years to around 15%-25% in recent years[3,6,20,25,31,40]. High-volume LDLT centres in Tokyo and Hong Kong, having extensive experience in management of biliary strictures, report a relatively steady rate of biliary strictures, of 20%-25%[8,41]. In an elegant study by Morioka et al from the Kyoto University, LDLT recipients were divided into three time cohorts which differed with regard to case experience. They found that while the rate of bile leak significantly decreased with experience, there were no differences in the development of biliary strictures among the three groups (19%, 28% and 26% in the three groups; P = 0.290). In a similar study from the University of Toronto, Shah and colleagues did not find any difference in the rate of biliary strictures after chronological stratification of their patient cohort into the first 65 cases and the next 65 cases. However, a recent study by Kim et al did show that patients who underwent more recent procedures were less likely to have biliary strictures, suggesting a small but important role of surgical expertise on the risk of biliary strictures. There seems to be several possible factors other than poor surgical expertise that result in bile duct injury and subsequent strictures. Among these, an important cause of strictures is postoperative bile leak that causes local inflammation and fibrosis[23,38,42,43]. Other factors identified include older donor age, preoperative model of end-stage liver disease score[40,43], multiple biliary ducts, graft cold ischemia time[41,44], bile duct diameter[44,45], acute cellular rejection and hepatic artery thrombosis (HAT). As evident, most of these factors lead to ischemic injury of the bile duct, eventually culminating in strictures. While ischemia is a major factor in NAS, it also plays a major role in the development of AS. This is because the bile duct epithelium is particularly vulnerable to ischemia, as compared to hepatocytes or vascular endothelium[46-48]. Local ischemic insults can also arise from devascularisation at the time of hilar dissection. Moreover, oxygen supply to the biliary tract is solely supplied by the hepatic artery. Therefore, HAT can lead to severe ischemic stress on the bile duct, resulting in fibrosis and strictures. HAT is a major determinant of NAS and complex, long AS that are usually difficult to manage endoscopically. In addition, technical factors like the number of biliary anastomosis, discrepancy in ductal diameters, unavailability of biliary microsurgical modalities, and aberrant biliary anatomy have been found to be significant risk factors for the development of biliary strictures[1,46,50,51] Moreover, endoscopic management is particularly affected in patients with multiple biliary anastomoses. Multiple causative factors with intersecting and often overlapping pathophysiological pathways make it impossible to implicate a single factor that can predictably lead to stricture formation. A useful approach would be to aggregate individual factors as a composite score for prognostication, early diagnosis and treatment. The most common clinical presentation of biliary strictures complicating LDLT is a cholestatic pattern of liver function test results, with or without symptoms of obstructive jaundice, such as icterus or pruritus. However, other causes of cholestatic jaundice, such as graft rejection (acute or chronic), recurrence of primary disease (hepatitis B/C), fibrosing cholestatic hepatitis C, sepsis or drug-induced cholestasis, make the diagnosis of biliary strictures particularly challenging. A high index of suspicion is warranted in such patients, especially since they rarely have abdominal pain due to hepatic denervation and immunosuppressants[53-55]. The diagnostic protocol practised in most centres involves a composite approach with clinical features, laboratory evaluation, imaging studies and liver biopsy. Among the factors detected by laboratory tests, bilirubin, alkaline phosphatase, gamma-glutamyl transferase and the transaminases are assessed initially. However, these tests are nonspecific, with limited diagnostic role for differentiating a biliary cause from a hepatocellular aetiology for the symptoms. Liver biopsy is extremely valuable to differentiate biliary strictures from acute cellular rejection, but since it is an invasive procedure with possible complications, it should be reserved for cases with a high degree of suspicion for rejection. Currently, the diagnosis of biliary strictures depends heavily on cross-sectional imaging, which classically demonstrates an anastomotic narrowing. Initial imaging with ultrasonography of the abdomen with Doppler study is carried out to examine the intrahepatic biliary radicles, along with vascular patency. However, the sensitivity of ultrasonography to detect biliary dilatation in the posttransplant patient is as low as 38%-66%, thereby rendering it unreliable as a sole screening modality for the diagnosis of biliary strictures[56-58]. A scan by hepatobiliary iminodiacetic acid scintigraphy is excellent for detecting bile leaks; however, its role in detecting biliary strictures is poor, with a sensitivity of around 60%[59,60]. Computed tomography is useful for detection of fluid collections and non-biliary lesions, having a higher spatial resolution than magnetic resonance imaging. However, it is grossly inadequate for the diagnosis of biliary strictures, unless used in conjunction with the injection of biliary contrast agents, like iodipamide meglumine. These contrast agents have been found to be unsafe, with higher incidence of allergic reactions; as such, the use of computed tomography for biliary strictures has fallen out of favour in most centres. Magnetic resonance cholangiography (MRC) has emerged as a reliable noninvasive tool to detect biliary strictures complicating LDLT. The presence of bile within the ducts allows for accurate delineation of the biliary tree, which can highlight the anastomotic stricture with diagnostic sensitivity and specificity in excess of 90%[62-64]. MRC can provide detailed imaging of the entire biliary tract and is especially useful for complex and intrahepatic strictures. Moreover, it can provide a roadmap for therapeutic interventions. MRC has a high negative predictive value that prevents unnecessary procedures[65,66]. The limitations of MRC include lack of interventional capability and high cost as a routine diagnostic modality. It has also been found to have a high rate of false positives. Most LDLT recipients with DD can show a narrowing of the anastomotic site in the absence of a ‘functionally significant obstruction’ (FSO). Here, FSO is defined as a critical obstruction at the anastomotic site that results in a clinically significant impedance to bile flow, evidenced by clinical symptoms and biochemical alterations of cholestasis. In our centre, a unique set of metrics are applied in the MRC to indicate FSO. While most literature alludes to a dilated proximal duct and a narrowing as pathognomonic of a stricture, we have found it useful to use the ratio of the proximal duct diameter to the recipient ductal diameter to signify FSO. This approach is based on the hypothesis that a FSO should cause impedance of bile flow that will result in the hold-up of bile above the stricture, causing dilatation and higher diameter on MRC, along with collapse of the recipient bile duct below the anastomosis, due to lack of bile flow across the stricture resulting in a smaller ductal diameter on the MRC. The resultant ratio may provide valuable clues as to the severity of obstruction at the anastomosis and enable a singular, reproducible definition of biliary strictures that can potentially dictate further treatment with better outcomes. The management approach practised in our centre using this method of diagnosing biliary strictures complicating LDLT is shown in Figure 1. However, prospective trials in multicentric populations are required before widespread application of this definition in the management protocol for biliary strictures. 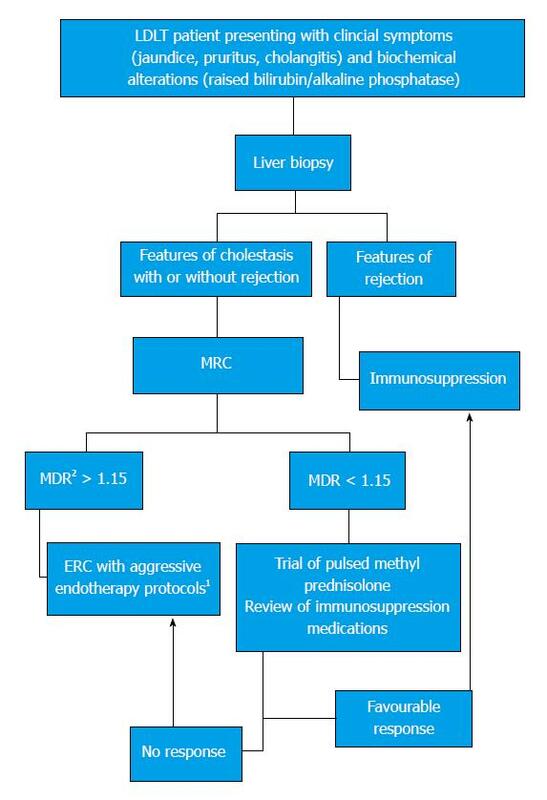 Figure 1 Management algorithm used in our centre for the treatment of biliary strictures. 1Aggressive endotherapy protocols: Multiple ERC with stricture dilatation and gradual upsizing of stents done every 3 mo for a minimum period of 1 yr; 2MDR = MRC ductal ratio calculated as maximum diameter of the recipient hepatic duct divided by the maximum diameter of the donor bile duct as seen on an MRC done at the time of presentation with clinical symptoms and biochemical alterations. The cut-off of 1.15 was computed after an internal review of our patient data showed a sensitivity and specificity of > 90% for the diagnosis of a functionally significant stricture (unpublished data). ERC: Endoscopic retrograde cholangiography; LDLT: Living donor liver transplant; MRC: Magnetic resonance cholangiography. Endoscopic management (endotherapy) is usually the first line of treatment for biliary strictures complicating LDLT and includes ERC with biliary sphincterotomy, balloon dilatation and stent placement[11,30,31]. Endotherapy is the mainstay of treatment and is usually the only avenue outside of surgery used in a majority of patients. However, endotherapy in LDLT recipients may be difficult because of complex strictures with multiple ductal anastomoses in bizarre configurations. It is a point of contention whether balloon dilation in isolation or balloon dilation with stent placement is superior for the treatment of biliary strictures. A higher complication rate notwithstanding, stent placement after balloon dilation should be the standard of care in these patients[67,68]. Moreover, endotherapy has the advantage over percutaneous transhepatic cholangiography because it enables the placement of multiple large-calibre stents, and is more physiological and less invasive. Who will benefit from endotherapy? Various studies have tried to identify factors influencing the outcome of endoscopic management in postLDLT biliary strictures (Table 2). The detection of these factors would help in streamlining the decision-making process and ideal patient selection for endotherapy. Donor characteristics, and pretransplant and posttransplant factors have been found to influence the endoscopic outcomes[9,22,31,43,69]. Chang et al reported an overall success rate of only 48%, especially for patients with NAS (P = 0.016) and strictures associated with posttransplant hepatic artery stenosis/thrombosis (P = 0.016). Kim et al reported that only the interval between LDLT and the first ERC had an effect on the outcome with endotherapy and, contrary to other reports, that longer stricture duration had a better outcome (P = 0.041). Swan neck deformity in right-lobe LDLT was also seen as a risk factor for difficult endoscopic procedure as well as poorer outcomes. Finally, bile leaks were found to be one of the most important risk factors for stricture formation as well as poorer stricture resolution with endotherapy. Kato et al reported a 51% overall rate of stricture resolution in postLDLT biliary strictures with DD and noted bile leaks as the major cause of stent failure. Our previous study showed HAT, multiple biliary anastomosis and older donor age to be significant predictors of poor outcome to endotherapy. Table 2 Therapeutic efficacy and factors affecting outcome of endotherapy in biliary strictures complicating living donor liver transplantation. HAT: Hepatic artery thrombosis; NAS: Nonanastomotic strictures; TACE: Transarterial chemoembolization. A paucity of conclusive evidence in the background of heterogenous patient populations and endoscopic management protocols make it difficult to identify a subgroup of patients who will respond to endotherapy in a predictable fashion. In this regard, uniform criteria for diagnosis of biliary strictures as FSO may aid in identifying patients with a significant stricture amenable to endotherapy, an approach that needs further validation. The timing of intervention has been an area that has lacked adequate validation. Usually, ERC in the first few weeks after LT is considered dangerous, due to the risk of damage to the anastomosis. This, however, is more applicable for bile leaks, as opposed to strictures since the development of strictures usually takes a long time. It is important to note that strictures that develop in the first 6 mo are more likely to respond to endotherapy than strictures that present late[20,69]. A subgroup of patients that merit further study includes those who present with asymptomatic biochemical alterations, liver biopsy inconclusive of rejection and imaging studies showing an anastomotic narrowing. The question of whether to wait it out or subject the patient to aggressive endotherapy protocols is a particularly harrowing one. On the one hand, there is considerable data which have demonstrated that a delay in treatment may be a significant determinant of poor response to endotherapy[71,72]. In a study by Buxbaum et al it was noted that a longer waiting time for ERCP was related with a greater likelihood of failure with endotherapy. However, the quantitative finding did not reach statistical significance. In our previous report, we found a similar inverse relationship between time to ERC and endoscopic success, but again the finding was not statistically significant. However, in the study by Shah et al, a similar patient subgroup was kept under follow-up with close observation and most were found to be stricture-free during the long-term follow-up. It would seem plausible that a delay in ERC with stent placement should lead to a suboptimal success owing to establishment and organisation of the fibrosis; however, the identification of strictures that merit treatment, as opposed to those that can be managed conservatively, warrants further study. Again, in this regard, the concept of FSO alluded to earlier may provide some valuable insights. Yet, larger studies exploring the accurate definition of FSO are needed before any recommendations are made, and current practice of early ERC with stent placement after balloon dilation should be continued until proven otherwise. Ideal endoscopic management protocols include ERC with endoscopic sphincterotomy, balloon dilatation and stent placement. Repeated ERC at 2- to 3-mo intervals with up-sizing of the stent or the use of multiple stents with or without repeated balloon dilation for at least 1 year is the most preferred protocol across transplant centres globally[2,3]. However, the need for balloon dilation of the strictures prior to the placement of endoprosthesis is not universally accepted, with some endoscopists opting for stent placement alone in the first ERC, followed by balloon dilations in subsequent ERC. Yet, there is no data that suggests superiority of this method over both balloon dilation and stent placement at the first ERC. In 2003, Park et al described an alternate protocol wherein patients without a significant narrowing on ERC are dilated with a balloon after sphincterotomy and a 5F nasobiliary catheter is placed above the stricture. This has many theoretical advantages in that it is easy to perform a cholangiogram to assess improvement of the stricture and obtain bile samples for culture; thus, occlusion of the drain is readily diagnosed and does not necessitate a repeat endoscopy to remove the catheter. However, it is not a widespread endoscopic protocol because of reduced patient acceptance with no uniform data on therapeutic superiority. An ideal approach to this decision should involve careful consideration of the time interval between the ERC and liver transplantation, the ductal diameters and length of the stricture before coming to a decision on the use of both balloon dilation and stent therapy. The need for endoscopic sphincterotomy has also been examined, with a few authors proposing stent placement across an intact sphincter of Oddi to reduce the incidence of cholangitis and pancreatitis[13,74]. However, there is no data corroborating this perceived risk of cholangitis. Moreover, we have found that the incidence of postERC pancreatitis is lower in liver transplantation patients than in the general patient population - a finding that was also observed in a multicentric study by Law and colleagues. This can be due to as yet unidentified effects of immunosuppressants on the inflammatory cascade that drives post ERC pancreatitis, representing an area that needs further study. The major disadvantage of endoscopic therapy is the necessity for frequent procedures required for stent exchanges, which may increase complications in addition to increased cost of care. Stent exchanges are usually performed every 2-3 mo to avoid stent occlusion and cholangitis. Most of the studies in this regard have been on DDLT patients, but it seems reasonable to apply the same protocol in LDLT patients. Few studies have performed stent exchanges and dilation every 2 wk and shown a superior success rate. Tabibian et al showed that a stent therapy protocol wherein stent exchanges are performed only once the patient is symptomatic is superior to protocol-driven procedures. However, it would seem pragmatic to exchange the stents every 3 mo for a minimum of four exchanges over a 1 year period and give a stent-free trial provided the last cholangiogram shows stricture resolution. Some Japanese groups advocate the placement of ‘inside stents’, whereby the plastic stent is completely in the bile duct with an intact sphincter, reducing the duodenobiliary reflux and consequently preventing cholangitis[13,14,74,78]. This is postulated to improve stent patency rates, with fewer ERC requirements and lower incidence of cholangitis as it prevents duodenobiliary reflux. The University of Kyoto reported use of a similar strategy, with modified Amsterdam stents placed inside the bile duct in 94/118 LDLT patients (80%) and yielding a stricture resolution rate of 68%. Tsujino and colleagues at the University of Tokyo, in as-yet unpublished data, have alluded to their experience in the area with 63 LDLT recipients who underwent inside stent placement. The median interval for stent exchange was as high as 161 d, with cumulative risk of stent dysfunction being 12.3% at 6 mo and 18.1% at 12 mo. Another promising approach is the use of the self-expanding metal stent (SEMS). SEMS was introduced to overcome the need for repeated procedures in conjunction with providing better and faster stricture resolution in these patients, owing to the larger diameter (30F) of the stents. The initial use of uncovered SEMS proved to be a disaster because of high rates of complications due to stent ingrowth and over-growth causing stent occlusion, formation of biliary sludge and stones within the stents, and more importantly vascular complications in the long term[79-82]. Covered (c)SEMS was subsequently introduced and seemed to counter most of the disadvantages of the uncovered SEMS (Table 3). The ease of endoscopic removal of cSEMS makes them an ideal treatment modality for benign biliary strictures. Table 3 Role of self-expanding metal stent in the management of post living donor liver transplantation biliary strictures. 2Unpublished data. cSEMS: Covered Self-expanding metal stent; DDLT: Dead donor liver transplantation; SEMS: Self-expanding metal stent. Randomised controlled trials in DDLT patients comparing SEMS with multiple plastic stents have shown they are similar with respect to stricture resolution, but SEMS required fewer interventions compared to plastic stents[83,84]. A recent meta-analysis also showed no superiority of SEMS over multiple plastic stenting, but supported the use of SEMS owing to shorter treatment time and fewer procedures. Very few reports have explored the role of SEMS in LDLT patients[86-88]. In an elegant study by Jang et al, a short fully-covered SEMS with a waist in the centre to prevent migration (Kaffes stent by Taewoong Medical, Seoul, South Korea) (Figure 2) was used in 35 LDLT patients with refractory strictures. The cases showed an excellent response rate, with 83% stricture resolution and 6% migration. However, the safety and efficacy of SEMS in LDLT is yet to be understood. At our centre, cSEMS was deployed in 4 LDLT recipients with refractory biliary strictures. However, stent occlusion due to sludge and stones was seen in 3/4 patients (75%) (unpublished data), necessitating additional plastic stent placement inside the cSEMS. Figure 2 Fully-covered modified self-expanding metal stent used in the management of biliary strictures complicating Living donor liver transplantation. The Kaffes stent (Taewoong Medical, Seoul, South Korea) is shown. The placement of cSEMS in high anastomotic strictures may also lead to blockage of secondary branches of the bile duct and subsequent biliary stasis in those segments. Tsujino and colleagues at the University of Tokyo advocate the placement of inside stents along with covered SEMS to counter this problem, and this approach seems to hold promise pending future studies. A particularly distressing complication of cSEMS is stent migration, which is reported in 16%-33% of cases[83,88]. The rate of stent migration seems to be higher in LDLT patients than other patients with benign biliary strictures. Finally, the placement of cSEMS may aid duodenobiliary reflux due to disruption of the sphincter mechanism and possibly result in ascending cholangitis. In order to discuss therapeutic efficacy, a uniform definition of biliary strictures has to be established. Most studies have used multiple criteria for endoscopic success, and these include symptomatic and/or biochemical improvement, imaging studies showing resolution of stricture, and absence of recurrence of cholestasis requiring endoscopic/percutaneous interventions[9,14,31,69,91]. It would seem beneficial to study these patients at two time points - one assessing the response after a protocol-based endotherapy practice for a minimum of 1 year, and a more long-term evaluation to assess rate of recurrence and need for repeat interventions. Both these treatment endpoint scans provide valuable insights on the course of AS and will help in establishing a uniform treatment protocol and follow-up. In the study by Buxbaum et al, long-term success was evaluated as a treatment goal and a 68% success rate was found. In our previous report, stricture resolution at the end of 1 year was only 48%. This low rate of stricture resolution may be due to a larger proportion of patients who had multiple biliary anastomoses, older donor age and/or a nonuniform endoscopy protocol applied for management. Future studies likely need to look at a composite outcome, combined with better patient selection criteria, which can yield uniform and predictable results of therapeutic efficacy for endotherapy. In the event of technical failure of ERC, which is defined as inability to cross the stricture with a guidewire, a percutaneous transhepatic cholangiography with biliary drainage via a percutaneous catheter can be performed[70,73]. It is usually successful, especially in patients with cholangitis who need urgent biliary drainage. Percutaneous transhepatic cholangiography with drainage is still a second-line therapy, as it is invasive and carries risk of complications like bleeding, pseudoaneurysm of the hepatic artery, bile leaks, infection, arterioportal fistula and portal vein thrombosis[45,92]. Patient compliance is also poor, and it is usually combined with an ERC in a rendezvous procedure at our centre. Using this technique, we have been able to get across the stricture in most patients. All our patients who have undergone the rendezvous procedure had subsequent successful ERC with stent exchanges, and documented resolution of stricture. We found that it is safe and precludes surgery in most patients with a primary endoscopic failure. As in any scientific work, the formulation of the problem is paramount for the development of a solution which more often than not is obvious to a trained clinician. To that end, the definition of biliary strictures in most studies is not uniform and needs to be re-examined. In the study by Buxbaum and colleagues, cholangiographic appearance of narrowing in a patient with altered liver functions were treated with endoscopy. In the study conducted at the University of Toronto, however, only symptomatic alterations of liver function tests in conjunction with a narrowing on imaging were considered for endoscopic management. In our study on LDLT recipients, we also included asymptomatic patients with biochemical and imaging features of biliary obstruction. This nonuniform definition is reflected in the varying success rates of endotherapy reported from these three studies (68%, 81% and 48% respectively). A stricture that responds to endoscopic therapy should be regarded as a ‘true’ stricture, or more appropriately a FSO. This may provide a multidimensional definition of biliary strictures that has the potential to streamline patients into mutually exclusive treatment pathways and ensure therapeutic efficacy. The ratio between donor duct diameter and the recipient ductal diameter on the MRC in conjunction with a subjective assessment of contrast drainage across the stricture during the ERC to indirectly signify the functional impedance to bile flow of the stricture has been found to be useful in our centre, having a superior therapeutic efficacy of 83% in preliminary findings (unpublished data). This approach to seek out an obstruction that is functionally significant in a symptomatic patient may yield a patient group who will be predictably responsive to endotherapy. However, it is important to understand that endotherapy may not be the answer for all strictures across the board. As Abraham H Maslow remarked - ‘If the only tool you have is a hammer, it is tempting to treat everything as if it were a nail’; it is important to realise that certain patients with biliary strictures of an unfavourable morphology will not respond as well to endotherapy. The correct identification of the patients who will respond to endotherapy is the need of the hour. The development of innovative modalities, newer stent designs and endoscopic accessories needs to propel future work in this area, especially for those patients who are refractory to stent therapy.